The line sounds good in part because your ear hears the consistency of structure. You also get a surprise from the implied motion (A to F to E) which moves contrary to the underlying chords. Note that the structures are still identifiable even when re-ordered, as are the A-7 and F-7. This is true of many structures. The structures over the underlying Dominant chords in the examples imply alterations. In the above example C#-7 implies G7 with #4, 13, and b9. 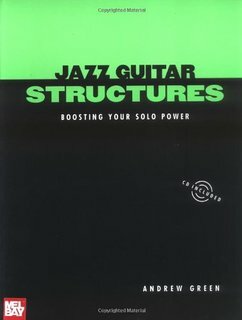 Using the structure makes it easier to play these sounds in an organized way. The choices as to where to build structures in relation to the chord/scale are different on Modal tunes, as opposed to moving chord progressions.